I have bought these a number of times. They are a hit with the family and are really quick and easy to cook for those nights late home from after school sports. The creamy garlic sauce oozes out when you cut it open and the chicken breast is nice quality chicken as well. I buy these a couple of times a month and my whole family love them. I love cutting the chicken open and watching the creamy sauce ooze out. The sauce is yummy, as is the coating and chicken. So easy, no preparation required. 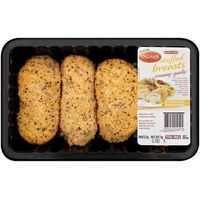 Obviously these are not true Chicken Kievs BUT they are a great alternative. They are rather tasty and you don’t have the hassle of wondering whether your kiev is cooked properly, then losing half of it to bone :/ Great with salad, fries or any veg really. Ingham breast stuffed with garlic l have tried and it was nice for a lunch meal.The garlic inside is the main feature l love and they are quite on the big side,so also filling! Great to add a side salad as well.A 3 rating out of 5! How would you rate Ingham Chicken Breast Stuffed Crumbed With Creamy Garlic?